With no signs of the Conservative FOX behemoth slowing in the midst of the election cycle, here in the UK, the man behind the curtain appears to be increasingly vulnerable to scrutiny (and maybe even the law). Thanks to Prime Minister Tony Blair's Communications Director, Alastair Campbell, detailed diary entries which describe conversations between Rupert Murdoch and Blair have become public. The diary reveals that Murdoch did indeed put pressure on the Blair Administration to speed up British involvement in the Iraq war. 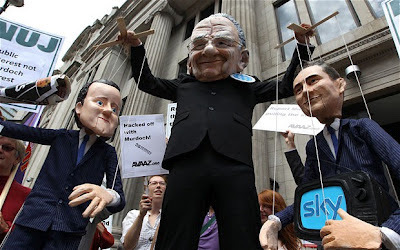 Murdoch had previously testified before the Leveson Inquiry that he had never used his position to influence the actions of Prime Ministers. However, the new evidence, detailed extensively by the Guardian, shows that Murdoch made a series of calls to Tony Blair in the weeks leading up to the Iraq war.